Fine Art Print Poster 11 x 14 1/2"
Studio Identification is for publicity purposes only and will not be included in your artwork. 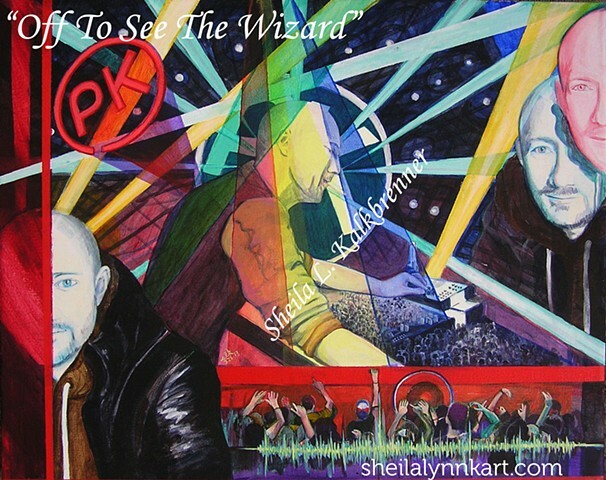 An original conceptual portrait based on imagery of German Electronic Musician Paul Kalkbrenner from publicity for his 2013 Guten Tag tour. The intention is to display the artist as he is viewed by his followers. When does the person merge with the persona? Is the individual lost in the icon? Which also begs the questions about the context of the "followers" consumed by the influence of an icon. The Original Unframed Painting is currently on display during the Artists Among Us Touring Art Program in Upstate New York until Dec. 2017. It will be available for pick up at the end of the tour. Contact the studio to schedule onsite purchase and pick up $150.